Here's a rough look into the construction pit for Standard Furniture. Note that the Second Avenue regrade on the right is getting its polish. 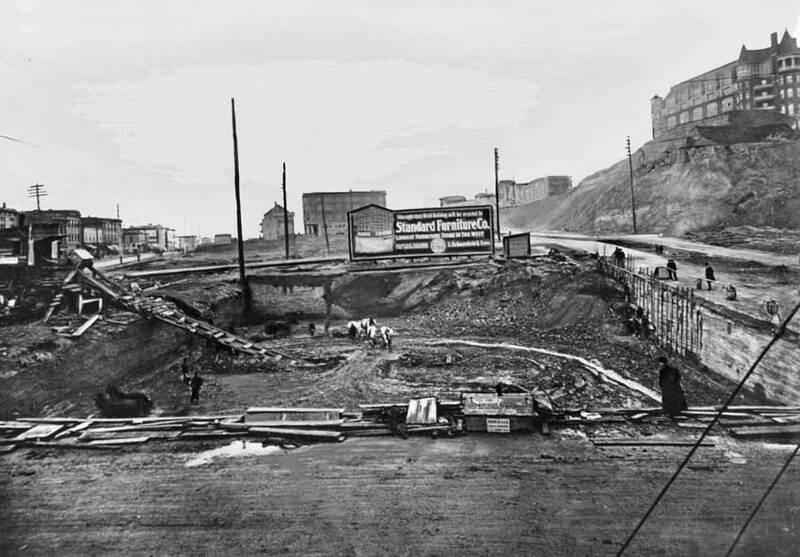 The old Washington Hotel (first named the Denny Hotel) atop the front or south summit of Denny Hill still stands, but not for long. It was destroyed in 1906 and by 1908 the south summit was removed and the New Washington Hotel and Moore Theatre filled the east side of Second between Steward and Virginia Streets. After more than one make-over it is still the same building. But Jean! I can no longer remember - after five years - if you or I took this "now." Please advise. 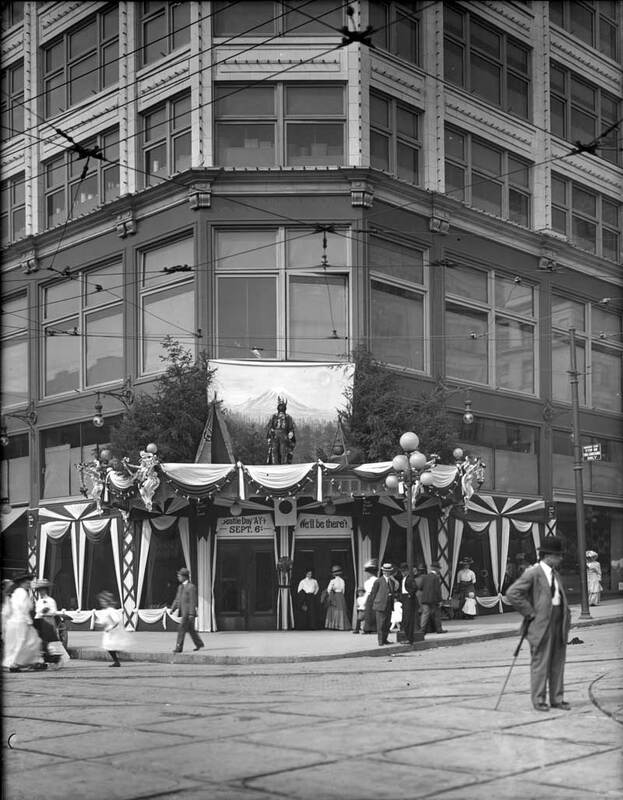 Here we see – above – what The Seattle Times for Sept. 5, 1909 headlined the “Unique and Attractive ‘Seattle Day’ Decoration of Standard Furniture Company’s Store.” Follows the Times reporter’s often thrilled description of “the most unique and attractive store decoration ever seen in Seattle.” We quote. 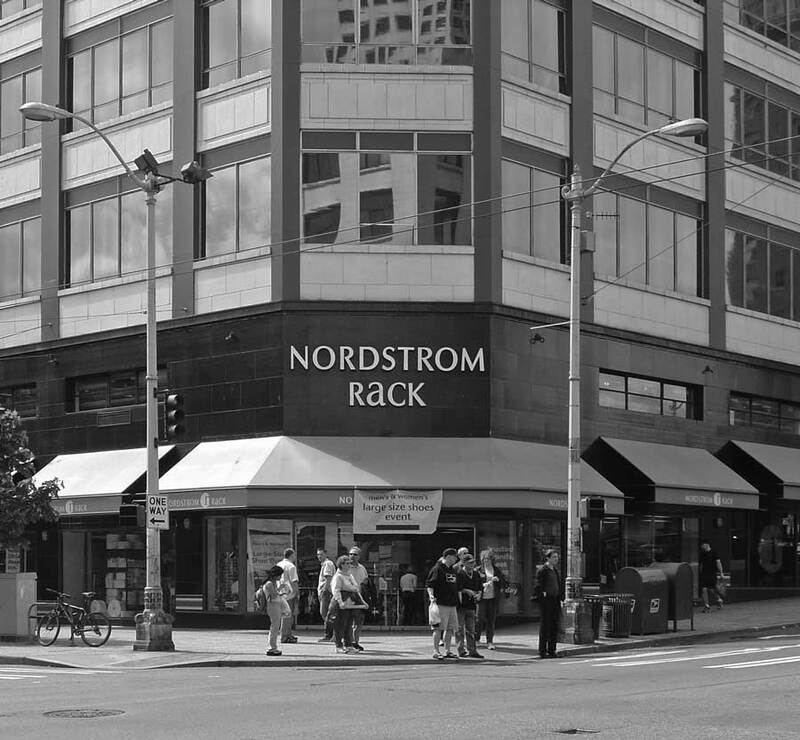 Then and now Captions Together: Raised up in 1905-07 while Denny Hill was being cut down behind it the Schoenfeld’s family new company furniture store was a fine example of what architectural historian Rev. Dennis Andersen – minister to both landmarks and souls — describes as architect Augustus Warren Gould’s, “restrained sense of ornament, favoring instead to accent the splendor of site arrangement and visibility of the structure.” Much later the building was stripped of what ornament it had – including its terra-cotta tiling – in what must have been another of those fleeting anxieties about what is in or out of style.